Due to our freak snowstorm, this post is interrupting Would You Read It Wednesday, so if you haven’t seen today’s Would You Read It, please scroll down or click here so Christie gets her pitch feedback! Thank you! Once upon a Halloweensie, 2 feet of snow fell out of the sky and caused all manner of trouble! So, the good news? Those of you who would like to enter the Halloweensie Contest and didn’t get around to writing your stories yet still have a chance to join in the fun! I’ll give you until the end of tomorrow – Friday November 4. For those of you who might not remember, the contest is for a 100 word story (in poetry or prose) suitable for children, using the words boo, candied apple, and jack-o-lantern. The story can be a little under 100 words but must not go over! If you don’t have a blog and want to enter, just copy and paste your story in the comments. Mom was out, so Caitlyn was babysitting for Dex and Jax. “Is it time yet?” asked Dex. They put two dozen candied apples on a tray. “Is it time yet?” asked Jax. They poured three jumbo bags of mini chocolate bars into the cauldron. They hung fake cobwebs around the door. They turned off all the lights. Caitlyn lit the jack-o-lantern. “Is it time yet?” whispered Dex. 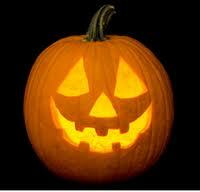 The jack o’ lanterns at the Barnes’ home were carved with cheerful expressions and a small flashlight inserted in each. No flamed candles were used. Mrs. Barnes was careful with fire—not wishing any young trick-or-treater to be burned. She had candied apples, just the right mix of sweet and tart, to offer each visitor. She wouldn’t even utter a “Boo!” determined that no guest would be frightened away. Trick-or-treaters flocked to the welcoming Barnes’ house—but never left. I hope you're not too hard on yourself trying to catch up with everyone. Just be kind to yourself and enjoy the electricity. It's nice to have, isn't it? Thanks for having this contest after all. Thanks for putting it together. Teri – I love your story. The last line is either lovely or chilling! Clar – thanks for the welcome back and for adding your link to the list. Your story was great, and I can see I'm going to have a very hard time deciding who should win!!! Bummer about the snow, but glad things are looking up! I want to do this. I wonder if I will find the time between scouting tonight and severe house cleaning. I love halloween stories. If I get something done I will come and add myself to the linky. Otherwise, I'll just visit and read everyone elses. Such a fun idea! 2 feet of snow?! Yikes! Well I'm glad you got your power back, and good luck to everyone entering! Randy – no more pro than you! You wrote a great story! Susanna, I loved your story and loved the contest. It was fun going to people's blogs to read theirs and I'm loving the link list. Terri, I like the mystery at the end of your story. Will you have a Thanksgiving contest? I'm sure I'm pushing the envelope here (we still haven't celebrated Halloween yet in my town)but this was a great creative exercise. How fun would it be to put together a Halloweensie Anthology???? I know, I know, now I'm creating more work for you. :)Glad you have power (and coffee) back. Wow 2ft of snow, and I am sitting down here with a lovely sunny spring day. Looking forward to summer in a few weeks…lol. I have a blog, but this type of poem doesn't fit my usual audience so I would prefer to post it here, if you don't mind. I realize that this poem's structure isn't terribly original… your blog title inspired it, of course. 🙂 But I hope it's fun! to laugh and talk and drink and eat. Scary stories, tales and fables. from neighbor porches in the night. all scary things become our friend. I get to laugh, I get to run. It is the night I like the most! Tracy – I WILL have a Thanksgiving contest just for you! No pressure to enter of course 🙂 A Halloween Anthology would be fun – the entries have all been so good! Kelly – I LOVE this – so clever! Thanks so much for joining the fun! Julie – did you lose power too?